Whilst many of us like to enjoy the sun and hot weather, we should make sure we do it safely and remember certain groups of people are more vulnerable than others to the effects of heat or ultraviolet radiation. Extreme heat can force the body into overdrive as it tries to stay cool through perspiration and evaporation. Young children and older people are particularly at risk. 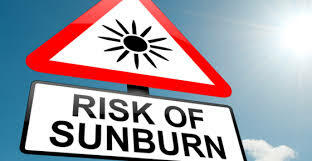 Overexposure to sun is equally dangerous, with effects ranging from mild sunburn to skin cancer. It doesn't have to be hot for the UV index to be high. Ensure you have plenty of cold fluids available. Try to stay cool by taking cool showers or baths and/or sprinkle yourself several times a day with cold water. Avoid too much exercise, which can cause heat exhaustion or heat stroke, and can even be fatal. Watch for signs of heat stress — an early sign is fatigue. Drink plenty of fluids, but not alcohol, which dehydrates the body. Try to eat as you normally would. Not eating properly may exacerbate health-related problems. If driving, keep your vehicle well ventilated to avoid drowsiness. Take plenty of water with you and have regular rest breaks. If you have elderly neighbours who may be at risk during a heatwave, try to visit them daily. If you do go out, try and avoid the hottest part of the day (11 a.m. to 3 p.m.) and seek shade where possible. Avoid being in the sun for long stretches. Check you have appropriate sun cream for your particular type of skin. The UV index (the strength of the sun) can be high at many times of the year — it doesn't have to be hot. The UV index can be strong through cloud even when the sun isn't directly shining. If you go out, wear lightweight, light-coloured clothing, high factor sunscreen and a wide-brimmed hat. Avoid being in the sun for long stretches. Reapply an appropriate factor sun cream at regular intervals during the day.